Oval Acrylic Hanging House Number Sign - - two sided, one-line address number plaque holds two, three, or four large numbers or letters. 9" x 6" oval plaque is personalized with the address characters you specify. Made in USA. Made from sturdy and UV-stabilized, non-rusting laminated acrylic with engraved numbers. For P2387 Comfort House Oval Acrylic Hanging House Number Sign and other 9x6 hanging signs, order our Hanging Sign Bracket #J0012 in the 12" size. Note: character count includes any spaces and punctuation. Two side 9x6 oval hanging sign. Same personalization appears on both sides. Made in USA. 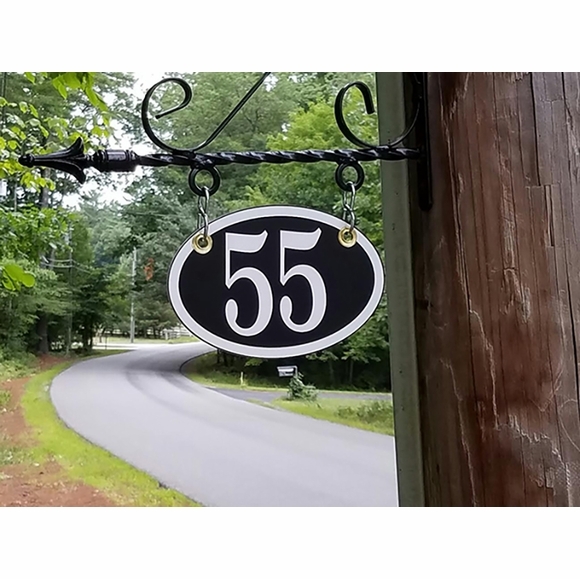 Thank you to customer CN of Hollis, NH, for sending in the photo of her #55 hanging address plaque mounted to a J0012 sign bracket in size 12 inch max width (see related products).